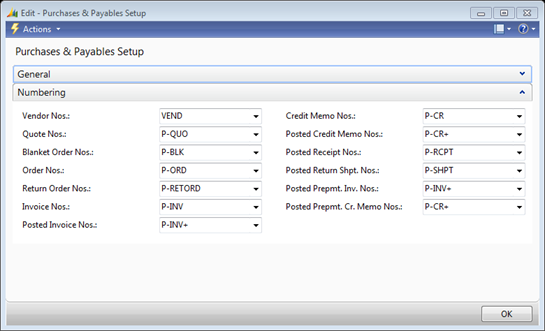 Microsoft Dynamics NAV does a lot of legwork for your organization if you set it up the way you need. One of the most extensively used features of NAV is the No. Series engine. 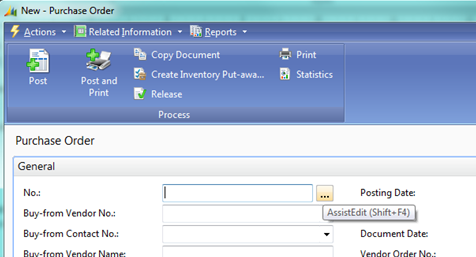 It provides new document numbers, new customer numbers, new journal document numbers, and all manner of other information. However, many customers simply accept the way it is set up for them without understanding the logic of the system behind it. Let’s take a look at Vendors, Items, and Purchase Orders to look at some of the different options open to us. 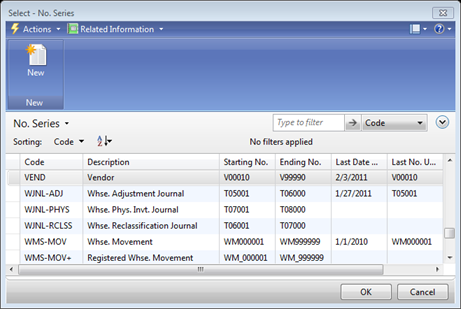 Here we can see that all new Vendors will get a VXXXXX style number, starting with V00010. We can also see that the Last Date Used was 2/3/2011 and the Last No. Used was V0010. This means if we were to go create a new Vendor right now, it will be given V00011 as the next number. Pretty simple logic: Each part of the system that gets a unique number has some setup field that controls which No. Series to use to assign those numbers. Some companies are fine with their PO’s being numbered 100000 through 999999, and some are fine with PO-10000 through PO-99999. 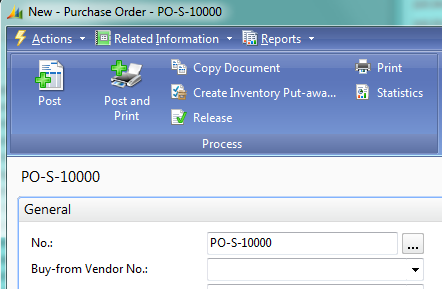 But, it’s also possible to incorporate some year (or even month) information right into the Purchase Order document number if you’d like, such as PO11-0001 through PO11-9999. For our example, the CFO has asked to switch to the PO[yy]-##### style next month, but not yet. This is pretty simple. We added a Warning No. of PO11-9990 so that the users will get a message as we’re starting to run out of numbers (if that happens). 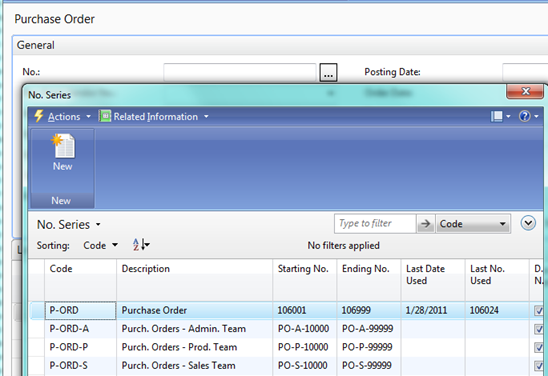 When 2012 starts to approach, as part of preparing for year end, we’d simply add more lines for PO12-0001, PO13-0001, etc. Most people would primarily use date driven numbering on Documents, but if you were to do something similar for Customers or Vendors, it will give you a built-in reminder of how long you’ve had that business relationship. Our customer who wanted PO[yy]-#### had a team meeting and voted down the idea of using year based documents for Purchasing (although they loved it for sales). Instead, they’ve decided that each Department in the company should have their own Purchase Order number series, so PO-S-10000 is clearly a PO from the Sales team, and PO-A-10000 is clearly a PO for the Administration team. Despite having the dimensions already setup, they felt this would add clarity to their reporting. Being able to bring these all together can make your records have lots of useful information packed into a small field. Consider your options, not just what is in place. Consider what you want to have to maintain at year end. Also consider what extra steps people may have to do on each document. 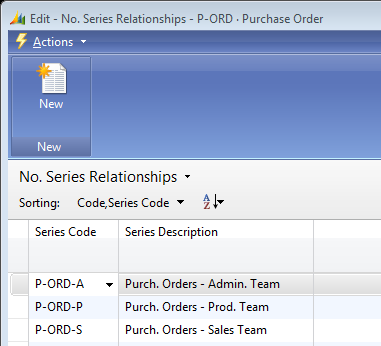 NAV Configuration Number Series, Purchase Order, Vendor, Year End. permalink.